The way people are searching online has changed dramatically in recent years. Thanks to smartphones, people can search for businesses wherever they are. With over 52% of web traffic coming from mobile devices, it is imperative to make sure your local business will be displayed in mobile search results. Google My Business is a function of Google that displays all of the pertinent information about your business at a glance. Your Business Profile appears when people search for your business or businesses like yours on Google Search and Maps. The image to the right is an example of how a customer would see a Google My Business profile on a mobile device. The profile displays contact information, directions, photos, and more in an easily readable format that users have come to expect. You might be thinking: But I already have a website, isn’t that enough? It’s great and very important to have a website, but having an updated Google My Business profile makes it even easier for customers to find information about your site. Here are a few reasons why a Google My Business profile can help your business and make it easy for customers find you! Nearly 40% of mobile searches are made with local intent. This means that customers are looking for businesses that are close to them. Google displays profiles that include information that is relevant to what a user has searched for. 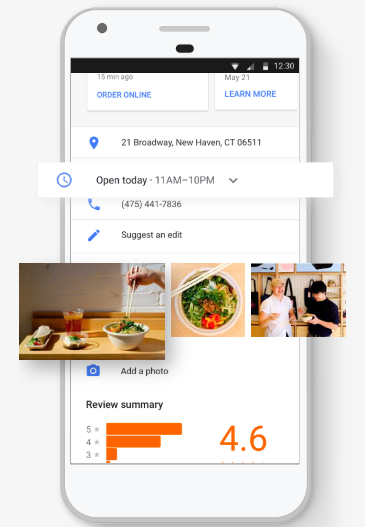 Pictured on the left is information from a Google My Business profile that customers might be interested in, such as hours of operation and images of what products are provided at the business. This is the type of information that should be included in your profile because it is of interest to your customers and is what will influence them when they consider whether or not to visit your business. Maintaining an updated Google My Business profile helps your site display in mobile search results, thereby improving your local SEO status and helping customers find your business both online and in person. Customer reviews are an important piece of your Google My Business profile. 74% of consumers say that positive reviews make them trust a local business more. If you have great online reviews, potential customers are more likely to trust that you are worth their time and commitment. Even if customers leave negative reviews on your profile, this provides you with an opportunity to turn their negative experience around and show your excellent customer service. Through this you can prove to your customers that it is their experiences that matter the most to you, not profits. Building customer trust and having positive reviews can show prospective customers that your business will provide exactly what they are looking for in a helpful and friendly manner. Google My Business also offers analytics about your profile that you can view. These analyze where your online traffic is coming from, which can help you to improve your website or profile and help you pinpoint specific audiences who are most interested in your business. You can use this information to target an audience and cater your business and messaging to the people who make up the majority of your customer base. 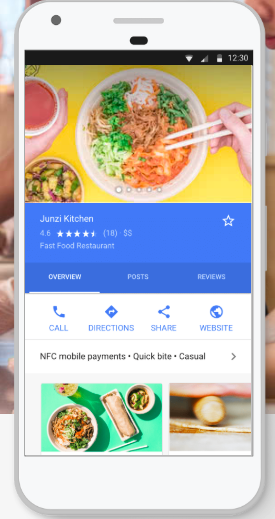 Having a Google My Business profile helps your business show up in local search results, shows potential customers what you have to offer, and gives folks all the information they need to visit your store.